Today we had to launch from Itchenor, making travel time one hour to the site. Arrived at site at 11:15 am. The weather was warm with northerly wind force 3, water temperature 16 degrees, visibility almost top to bottom in 9 metres, horizontally 6 metres +. Recovery of the excavation frame was straight forward, visibility was so good Dan took some really good photogrammetry of west side cannon. 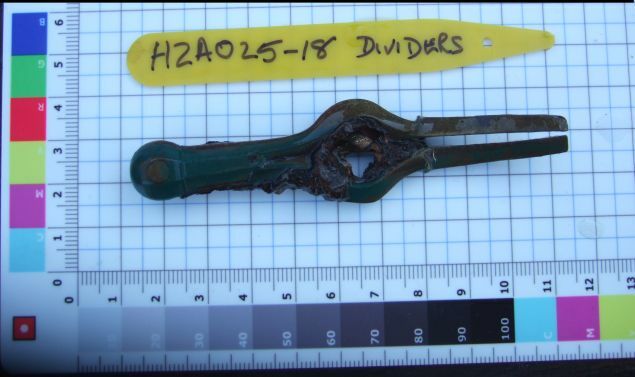 April found two artefacts laying on the seabed, copper alloy dividers south-east of the cannon ball mound & a pewter ? decorated button close to cannon H.
It has been noted that localized erosion is taking place along the outside of the east frames and in several places the clay hard pack is visible. It is also visible south of the break in places. Some seabed movement is noted north and west of the bow and much degradation of hull timbers is visible in this area. Some of the lead sheeting trapped between hull timbers at the bow, now lays on the seabed. The gun and carriage discovered near the bow on the port side in the early 90’s and recovered with polythene and seabed material, is now almost completely uncovered by natural erosion and a large part of the carriage has been eaten by gribble worm. It is likely more artefacts lay uncovered, however time restraints and lack of air meant it was not possible to stay longer! The excavation frame was taken to the beach at Bracklesham for recovery by vehicle, rib returned to Itchenor, trailered at 4:35 pm. HZA025-18 = Bow legged copper alloy dividers with some iron concretion attached. HZA026-18 = Pewter? button patterned.